An appeal to store pet coke on the banks of the Detroit River drew a crowd about 30 environmentalists Sunday afternoon. 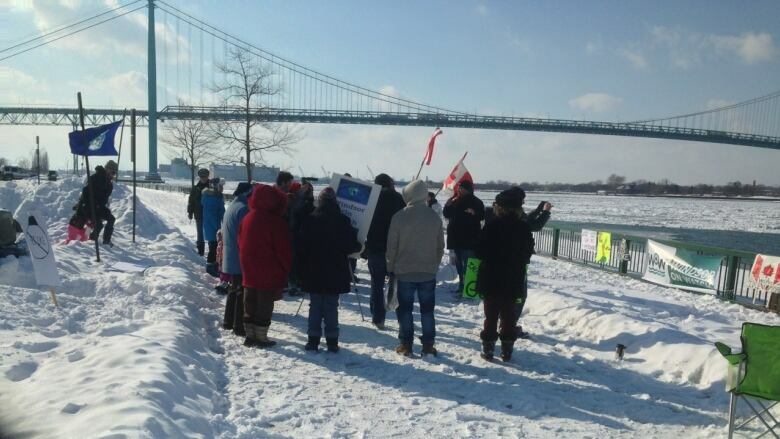 Residents protest an appeal made by Detroit Bulk Storage to stockpile pet coke along the river. An appeal to store pet coke on the U.S. banks of the Detroit River drew a crowd about 30 environmentalists Sunday afternoon. Windsor residents gathered to protest the company appealing a storage ban implemented by the City of Detroit in August. Detroit Bulk Storage wants permission to stockpile pet coke on the American side of the river again, right across from Assumption Park. Petroleum coke, also known as pet coke, is a black, rock-like leftover of the oil refining process. Activist Randy Emerson says it makes no sense to store the material on the waterfront. "We're here to tell the City of Detroit that when you make that decision on that ban, you're not just making that decision for Detroit," he said, "you're making an international decision." Detroit Bulk Storage claimed last year it didn't know a special permit was needed to stockpile pet coke in the open air along the river. "If you have big, black pet coke piles over there, and pet coke goes in the river, those ducks are going to think it's something to eat," Emerson claimed. "It's not. It's toxic." Another longtime pet coke protester included Pat Noonan. "We've got to fight what's being put into our world, our air, our water," she said. "Let's keep on fighting." An appeal is expected to be heard Tuesday morning in Detroit. Protesters on both sides of the border are calling for the appeal to be denied.